I met with Jacob Skinner who attended the Deep Learning in Healthcare Summit this February and told us a little bit about how he’s been applying deep learning to wearable technologies over the past months. The company of which Jacob is CEO, Nine Degree Products (NDP), is focused on ‘bringing good ideas in the wearables space to life’. They focus predominantly on products that will improve people’s health, fitness and wellbeing to solve real life problems that people are struggling with every day. Jacob explained how they ‘help founders, digital agencies and corporates to rapidly prototype, develop and get Wearables to market.’ The complexity of these products is astounding and we heard how ‘the advances in AI, machine learning and predictive analytics are presenting a huge opportunity to enhance the effectiveness of these products, and create a ‘seamless interaction between the wearer and the wearable’. NDP are pioneering and passionate about this new generation of wearables and are using AI to solve problems in early stage product development. We innovate, invent and iterate technologies and put the user experience at the heart of the process to give our clients unique and impactful products that target genuine problems and have a positive impact on society. I spoke with Hadeel to find out more about her project. How did you come up with the idea of RE•VOICE? I was doing a Masters in Computational Arts and was developing an Air Draw program with hand gesture recognition system. I held a demo session at a show and people wanted to add their names to their paintings so I tried to change the output to finger spelling and the accuracy rate was amazing. Meanwhile a gentlemen named Phoenix Marcón was working on a similar idea in America. I came up on his radar when he was doing a patentability search so he reached out to me. We connected right away because we shared the same vision so we decided to form a partnership from two sides of the globe to make this glove a reality. What inspired you to use machine learning as a vehicle for translating sign language? After a couple of rounds of testing with multiple users I realised there are huge variations between singers' hand gestures and that affected the accuracy results of the glove. 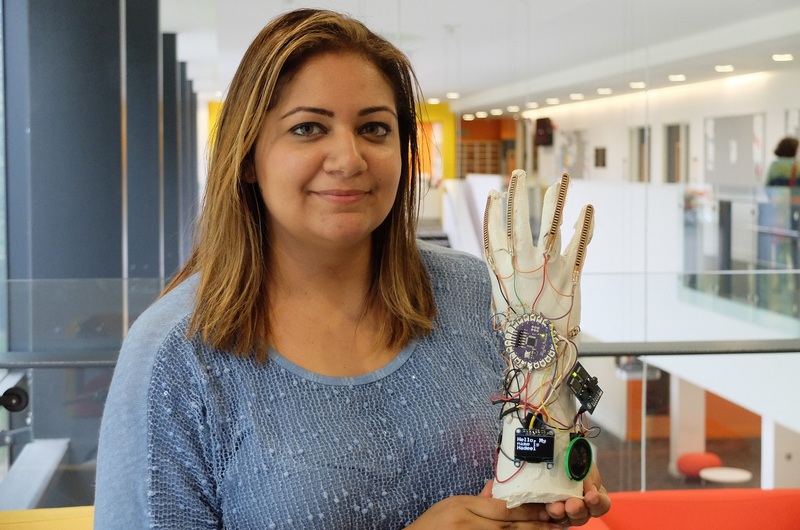 I added the training mode to allow users to add their own versions of sign language and for that I had to use machine learning algorithms to make the glove learn from the user and classify new gestures. Machine learning allows every user to build a customised library of sign language which he can use offline. How will the real time translation positively impact the lives of the general public? Realtime translation allows sign language users to interact directly with the general public without having a translator with them. It removes the communication barrier which signers face on a daily basis. How is machine learning positively disrupting other industries, and what progressions are you most excited for? Machine learning makes innovations smarter and enhance user experiences. The more the user interacts with the innovation the better it gets at responding. I am biased and I would say the best applications I am excited for are those directed towards healthcare innovation and digital health. Also innovations with social impact which has a major community contribution. What advice would you give to women starting out in the field/technology in general today? To surround yourself with a very supportive network and to connect with other women in tech. Not to be intimidated in major events when you'll probably be the only woman presenting or showcasing. I actually joke about it and use it as an icebreaker in most of my talks. Hadeel and Jacob estimate that RE•VOICE will be market ready within the next year.